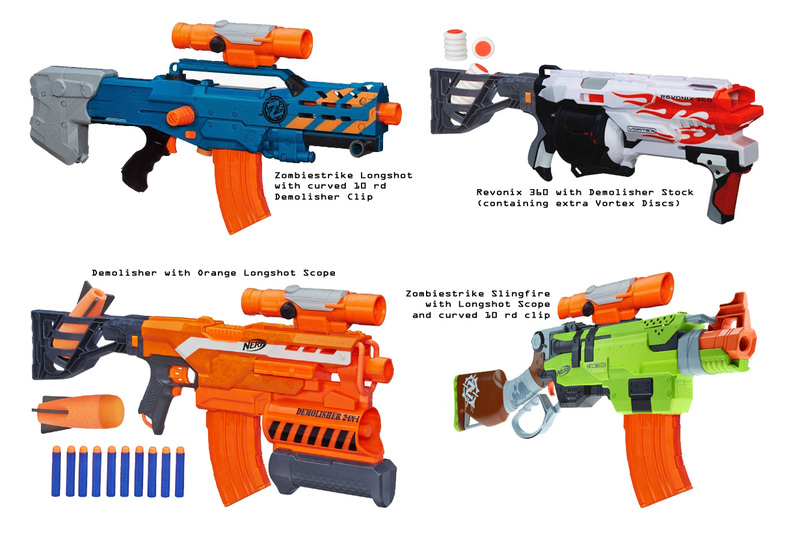 Reddit user Buster-99 recently shared this photo mockup on the Nerf Subreddit. For Reddit. Playing around with some new blaster parts before the real things hit the store… I tried to keep these to scale for size comparison. As you can see, he’s swapped parts and accessories out from the Zombie Strike Slingfire & Longshot CS-12, the Vortex Revonix360, and Elite Demolisher 2-In-1. I gotta say, that banana mag looks good on the Slingfire and Longshot, and the Revonix360 looks a lot better with a scope on it. However, the addition of the Longshot CS-12 scope on the Slingfire makes it too orange for my tastes. Which combination above is your favorite? 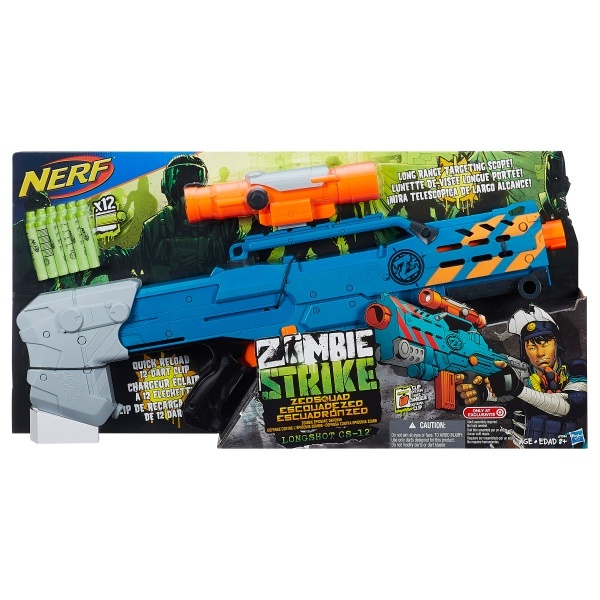 According to Walmart.com, the Longshot CS-6 is back on sale in stores! However, take this with a grain of salt. The url itself references a “Yamaha YPT220 Personal Keyboard”. If you want to head to your local Walmarts in the USA, feel free to let us know what you find. The Walmart number is 070035161. The First edition Longshot, which came in Blue. The 2007 Longshot CS-6 is an iconic Nerf blaster for Nerf enthusiasts and modders. It was the first clip system blaster, and it was also the first to introduce & use the notorious Streamline Dart. 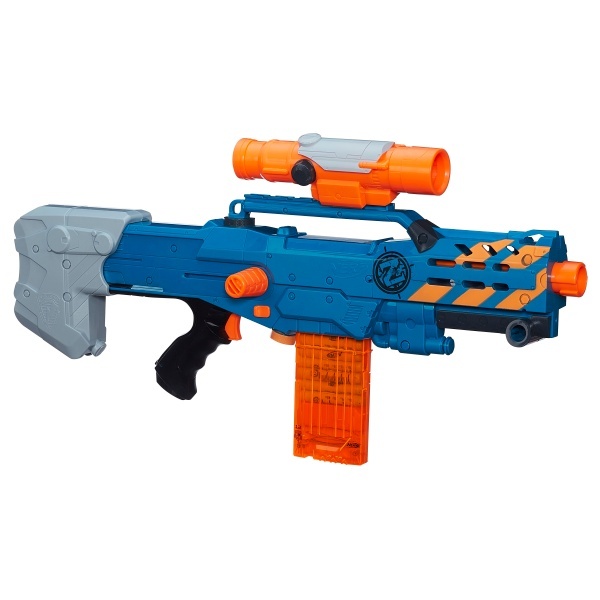 With the blaster being almost five years old, is this still a viable battle choice in stock skirmishes? We’ll answer that question, look at it’s history, and more in this review. Also please note, everything I talk about in this review (ranges, size, accuracy) is without it’s front barrel blaster, unless i specifically mention the barrel being used.